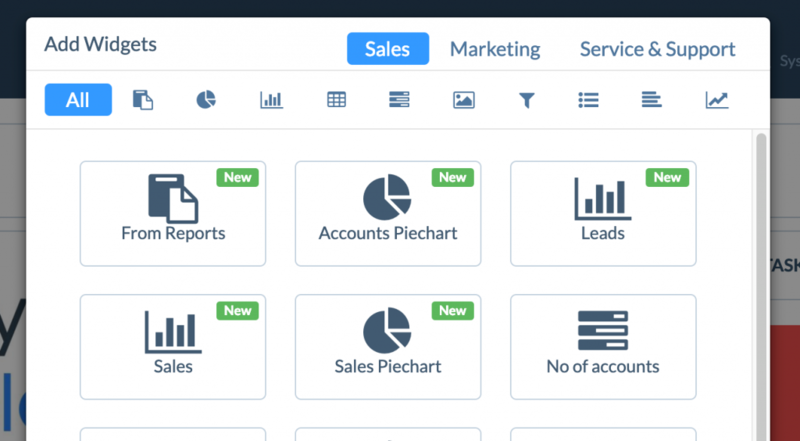 Every CRM user can create their own custom dashboard, creating and adding dashboard widgets by clicking the “ADD WIDGETS” button on the right of the screen. In the top-right of each widget, you are able to edit, resize, and delete them as you like. If you want to re-position your widgets, with your mouse, simply hold down the left click button in the title bar, then drag and drop the widget. 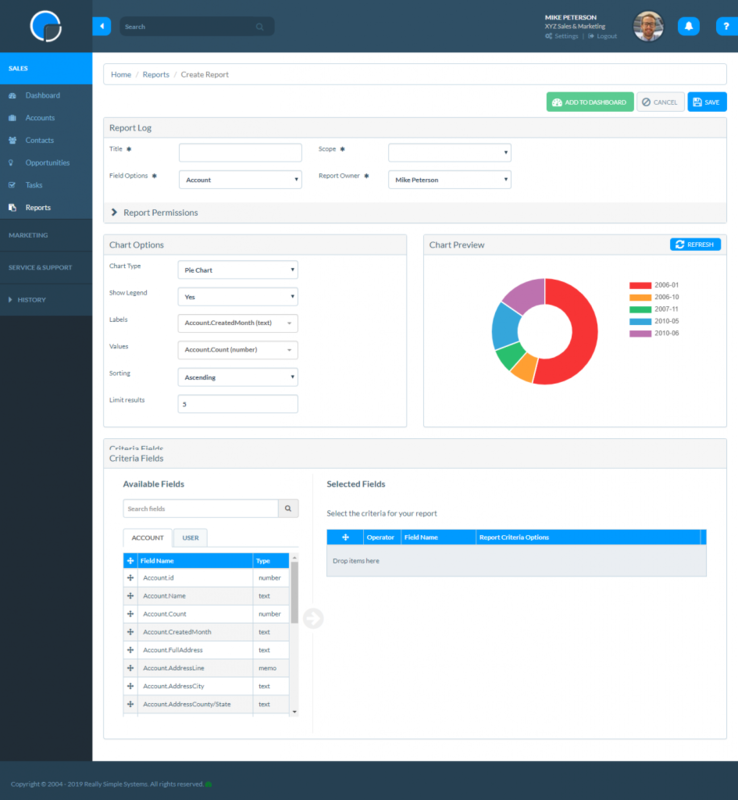 At first, your widgets will be empty but as you start to use your CRM, adding company accounts and opportunities, the widgets will be populated automatically. Click “ADD WIDGETS” will bring up this screen. Simple click in the widget icon to add it to your Sales, Marketing and Support dashboards. If you would like to add a company logo to your dashboard, first select the Company Logo widget in Add Widgets. This will create a logo widget on your you dashboard. Left click the widget, choose your logo file, and your logo is now on your dashboard. In the “ADD WIDGETS” menu you can create configurable widgets that display variable data on your dashboard. An example is the “Accounts Piechart”. Once you click on “Accounts Piechart” you will see a new window asking you to select the data field. Here you can choose Type, Country, Sector, or Source before saving the widget to your dashboard. Report Widgets (beta version) are available in Advanced Reporting on the Enterprise plan, letting you can create widget charts from your reports. To create a Reports Widget, click on the option “From Reports” in the “ADD WIDGETS” menu. From here you can create a widget by clicking “CREATE NEW CHART” or by selecting a previously created Chart. You can also create a Report Chart by clicking “ADD CHART” in the Reports Section of the CRM. After clicking “Create new chart” or “Add chart”, you will be automatically be taken to a “Create Report” screen. First, you can choose the title, scope, field options, and report permissions in the “Report Log” section. Next, in the “Chart Options” section, configure your chart. As you make changes, you will see a “Chart Preview” of your widget update on the right. Chart type – pie cart, bar chart, line chart etc. Show legend – will show the labels in a separate block to the side (Mainly used for PieCharts). Labels / X-axis – on a pie chart this will be the names of the slices and shown in the legend. On a bar/line chart, it’s the X/horizontal values. Values / Y-axis – on a pie chart this is the size of the slices. On a bar/line chart it’s the size of the bars or height of the line. Sorting – useful if you are wanting the top results rather than the bottom. e.g. if it was countries by the number of customers, and you wanted the most popular countries you would set Descending. Limit results – if you don’t want too many pie chart slices, or wanted to go back 3 months on a time based chart, or to show the top 5 of a set of data. Note – for the Labels and Values, you can select most fields from Data Dictionary, but not all. We may need to adjust the available fields here, and/or create new derived fields for certain custom situations. Note – that when you select “Gauge” or “Number” chart types, the fields change to a more limited set of options that fit those chart types. Finally, Choose your data Criteria. Your report widget uses the same data criteria as Listing and Forecast reports. When you’re happy with your widget, click “SAVE” on the top-right of your screen and then “ADD TO DASHBOARD”. Choose which Dashboard you want to display your new Report Widget in (Sales, Marketing, or Support) and then click “CREATE WIDGET”. Your Report Widget is now created! You can now click to view your dashboard and reposition, edit, resize or delete as you wish. Note: To edit your Report Widget, click the dropdown icon in the top-right corner. From the dropdown, you will be able to change the Report Chart being used by the widget with “WIDGET SETTINGS”, refresh the report data with “REFRESH DATA”, or update/edit the report criteria with “EDIT CHART”.